In my reading of the Vinland Sagas (the Saga of the Greenlanders and the Saga of Eric the Red) the character of Freydis Eriksdottir caught my attention. Here was a character who not only fought the Skraelings but also massacred her own people. Just perfect for scenario writing! 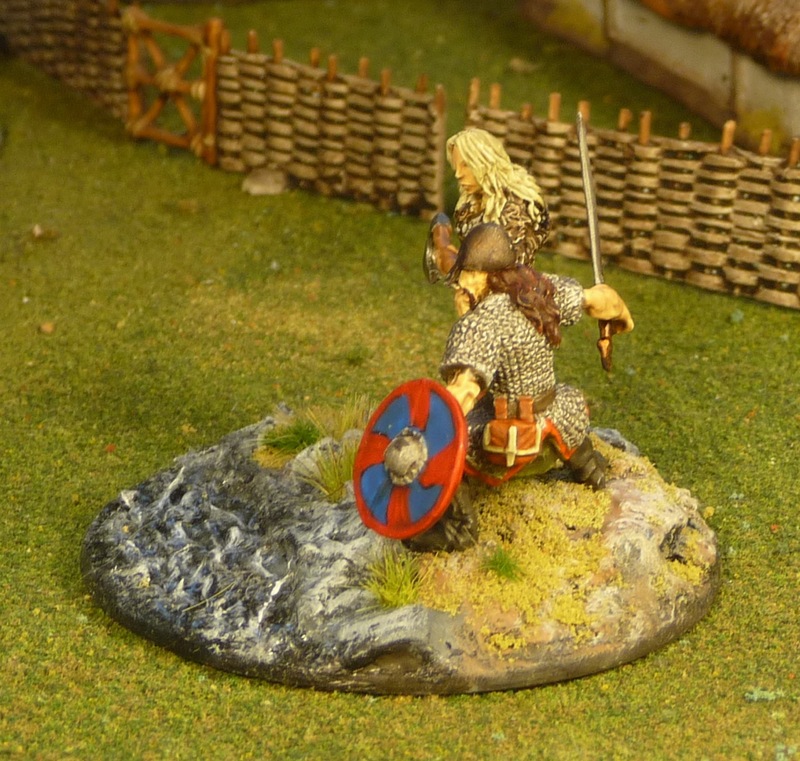 So started my search for a 28 mm figure that I could use for Freydis. Unfortunately, most female Vikings available were Valkyrie types, and this did not really work for me. 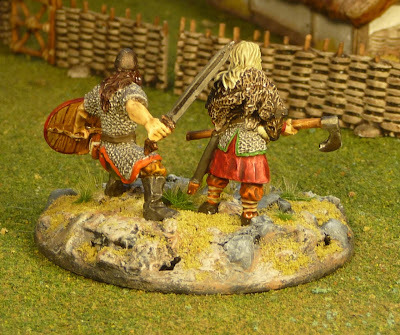 Then I got a lead to some new figures from Bronze Age Miniatures. Here were some non heroic figures that were just ideal for how I envisioned Freydis. I have placed her on a 60 mm stand that I am using for SAGA warlords and as as been my plan with warlord stands 2 figures were used. Both figures are posed at the edge of a stream. It looks like they are about to confront some Skraelings or maybe some other Vikings. I have used some Woodland Scenics water effects to replicate a stream. Not sure how successful this was, maybe I should have used more. Still a little shiny, the matt has not completely dried. Anyway she is a nice addition and I am really looking forward to getting a chance to play Nicolas's Vinland campaign. Anyway here is where I need some help, I am pretty new to SAGA, so I wonder if anyone could suggest some special rules for Freydis Eriksdottir. I do not think that she should have special armour rating or fighting ability, but more so a special ability to do with cunning and maybe should we say feminine wiles! What a great idea! 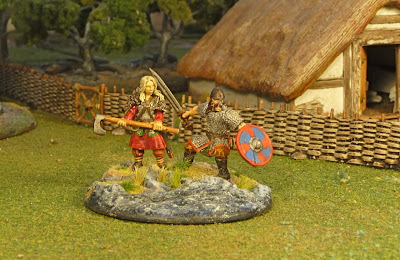 I've always shied away from the Viking maiden types, they also look like fantasy figures, but that's a very nice figure. I'm sure Freydis would approve. John this figure is superb! Again you kill me with the basing! 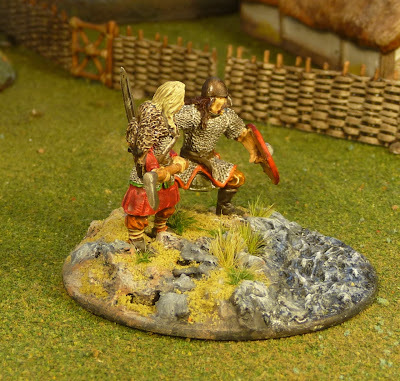 May I say that Bronze Age Miniature was exactly the manufacturer I had in mind to find a mini suitable for such a female character. Lovely figures and base, John. She sounds like a real tough as nails b*tch! NOt one to get in the way of! According to the Vinland Sagas, she drove away the Skraelings by screaming and bearing her breasts. Maybe some equivalent of the Anglo-Dane Intimidation ability, i.e. cancelling an opponent's activation. Great looking figure. Also, Foundry makes some shield maidens that for the most part look realistic, rather than fantasy. Great little base there, love the pensive look as she looks over the stream, compared to the ready stance of her companion. Really gives an image of the cam before the storm. Very cool mini , good work !!! Great miniature. Ive been tempted to get me some Bronze age miniautures but have been a litle afraid they would tower over the regular rank and file troops. Hope to see a size comparison with your regular Vikings later. That is a fabulous figure, John, and you did such a great job on the whole composition. Well done! I agree with the others in that some form of taunting would be suitable. Perhaps a rule where she could sacrifice a friendly model for some sort of special attack or riposte?